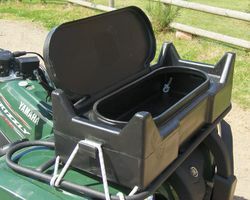 The Wydale Dry Box is designed to fit on the front frame of larger bikes or on the rear frame of bikes under 250cc. It is quick & easy to remove and is ideal for keeping your tools dry. It is maintenance free, practical, durable and great value for money. Corner upstands will support a bale of hay.